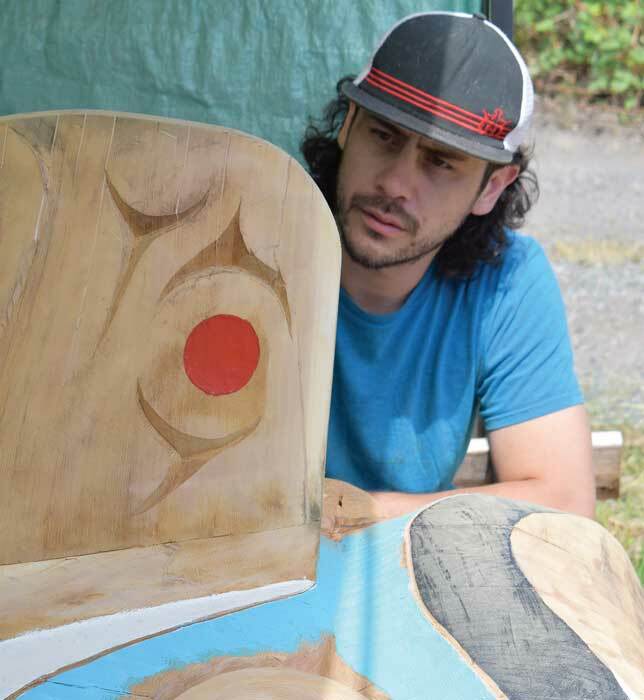 A pair of house posts has been unveiled at Snuneymuxw’s original village site St’litlup. 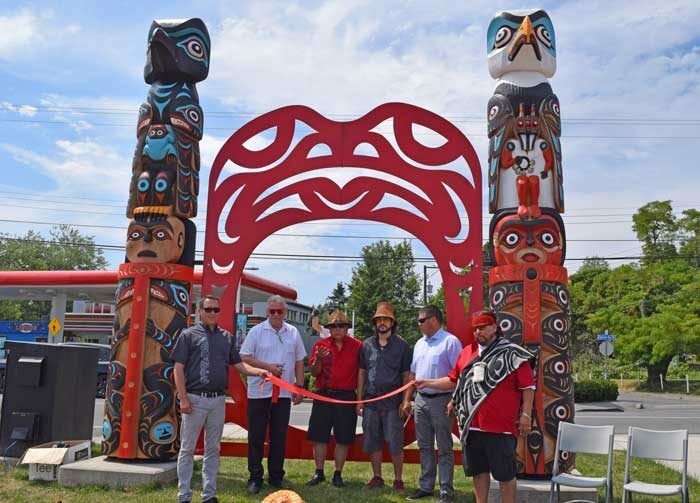 The five-metre-tall red cedar poles give a prominent visual representation of the nation at the significant site that’s now widely known as Departure Bay Beach. The posts were carved by Joel Good with guidance from his father, master carver William Good, over a period of seven months. The project was the result of a partnership between Snuneymuxw and the City of Nanaimo. 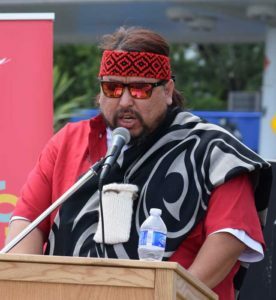 During an unveiling ceremony on June 20, Joel’s cousin Lawrence Mitchell (Ćumqwa:tun) of Snaw-naw-as spoke on behalf of the artists. 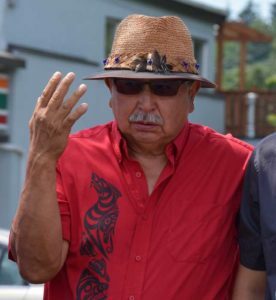 He explained that Coast Salish house posts traditionally visually depict the family history of the chief and the families of the house, along with their rank and lineage. Mitchell explained how the poles feature rich visual representations of the Good family, including the family crest—an eagle bringing salmon to the people —and a frog clan crest to illustrate the family’s frog song and for good luck. The lower side of one of the poles depicts the nation’s creation story with two wolves, which are said to have swam across the Nanaimo River on a cold night and shed all their fur to become the first Snuneymuxw man and woman of that area. Joel Good paints one of the poles at his family’s home in Snuneymuxw. Snuneymuxw master carver William Good. “The posts would face the ocean to let any visitors arriving by water know what territory they are on, where they’ve landed, and the style of artwork lets them know who the people are,” Mitchell said. The poles feature a laser-cut steel frog portal piece in between, which was designed by Joel to resemble the front of a longhouse. Joel said he originally wanted to actually build the front of a longhouse, but engineers concluded that something of that design wouldn’t be able to withstand the wind without collapsing. The frog portal opening was designed as a compromise so that wind could flow through. “The engineer agreed so I did up an original painting of this and gave it to the city, and they digitized it,” he said. The company Inter-Kraft then created the portal piece from that painting. 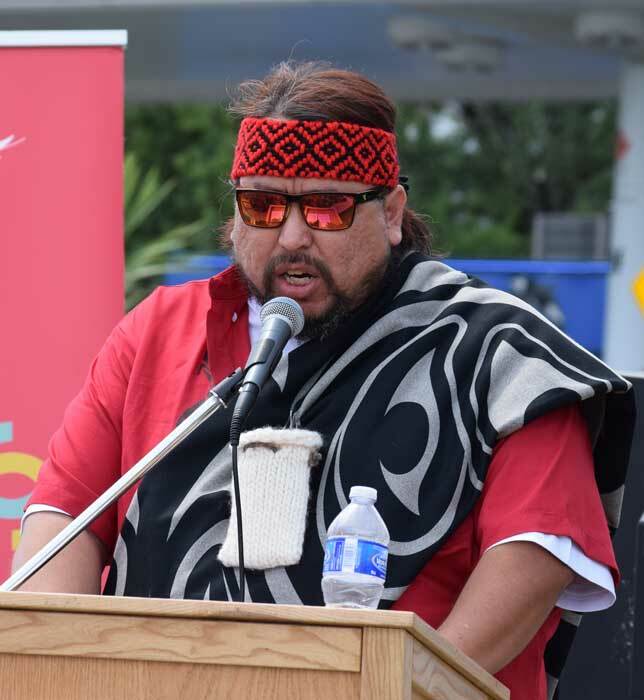 Joel said it is significant to see the large representation of Snuneymuxw at St’litlup. Snuneymuxw once came close to losing its traditional art style because of colonization, but William Good worked to revive the style to where it is today. Nanaimo’s culture and heritage coordinator Chris Barfoot said the Departure Bay project was an opportunity for the nation and city to work together as part of a larger waterfront enhancement plan. “I believe that art and culture has the power to be the catalyst for communities to continue to grow and thrive,” he said.